Hold your team meeting in the impressive Wratten Room with its spectacular views; or for smaller groups hire our second space - The Exchange. 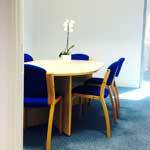 Modern communications, excellent facilities, professional support and easy booking. TOPRA’s meeting rooms offer everything necessary to facilitate your meeting – be it a presentation to up to 30 potential clients or a private discussion with a few key colleagues. Both rooms are available for hire from 09:00 – 17:00, Monday to Friday (with some flexibility) and can also be booked for shorter meetings. A perfect Board Room or training room – you can choose how the room is set up to suit the purpose of your meeting and the number of guests expected. The room’s capacity is 30 (lecture-style) – ideal for training sessions with state-of-the-art audio visual equipment, lectern and conference facility features. A great backdrop for high-level discussions or interviews with six participants or fewer. The room is also suitable for individuals who need some office space for a day or less in Docklands in order to work or prepare before a meeting nearby. We can tailor a package according to the support you require, the set up necessary and catering facilities you need. 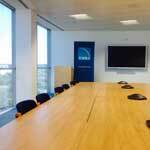 The Wratten Room and The Exchange are located at TOPRA headquarters in Harbour Exchange Square, London E14.